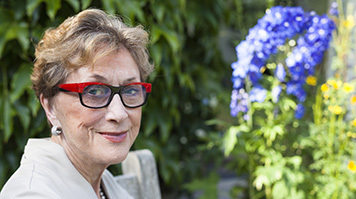 Dame Carol Black is an Honorary Doctor of Health and Social Care at LSBU. A distinguished clinician and researcher in the field of rheumatology, she has carved a niche as an influential government adviser on issues relating to health and the workplace. She is currently Principal of Newnham College, Cambridge. "The thing that saved me, and made my life so different to that of the rest of my family, can be summed up in one word: education. I was the first person to go to grammar school and then on to university. Of course there will always be these rare individuals that make it to the top with no qualifications, but for the majority of people education is the key to escaping poverty and leading a rich and rewarding life. "My first degree, in history, was a false start to put it mildly. At school, I’d been fired up by a superb teacher who taught me to think of history as a people subject, rather than being about constitutions and wars. When I got to university, it was all completely different and I found it very hard to engage, sitting in large lecture theatres with some 200 other people. By the end of my first year, I knew that I wanted to study medicine instead. I wanted that sense of discovery and to feel I was doing something that would help people. The lesson I took away from this part of my life was, if you think you’ve made a wrong choice, speak up. It’s never too late to put things right. "I didn’t think there was any way I’d get in to medical school. I had only studied science to O-level. By way of compromise, I decided to become a medical social worker. But the course director knew that I wanted to become a doctor. When the late Cicely Saunders came to Bristol to lecture, a meeting with her was arranged for me. I remember Cicely saying to me: "I’m going to try my hardest to put you off medicine, and if I don’t succeed, then you must do it." I applied for and got a place on a course for the First MB [the Bachelor of Medicine degree programme], but had to give it up because my local authority, perhaps not unreasonably, would not support someone who already had a degree. "The door opened for me in a most unexpected way. I was so disappointed at not being able to go to medical school that I decided to join Voluntary Services Overseas and teach. I asked them to send me as far away as possible and they duly obliged with a posting to the Gilbert and Ellice Islands in the western Pacific. When I got there – after nine days sailing from Fiji on a copra-collecting boat – I found, much to my surprise, that they were planning to pay me a graduate salary which meant I could save enough to start the course. I immediately sent a telegram to Bristol asking them to let me take up my place the next year, which they did. "Being from a non-traditional background, and taking an unconventional path, creates both challenges and opportunities. I remember in those early days really resenting the fact that I hadn’t been able to study medicine from 18, and that I was eight years older than the people I was competing with for jobs. But I came to realise that having travelled round the world, lived alone and worked hard to support myself through my degree actually gave me a lot of useful skills to draw upon. "There’s no point waiting for someone to tap you on the shoulder. If you want something, you need to be prepared to put yourself forward. When I was at the Royal Free, someone had to suggest to me that I should apply for the role of medical director. I knew the post was open and that I could do it, but I didn’t have the confidence to go for it without that push. Fortunately that’s something that’s built up over time. When it came to becoming President of the Royal College of Physicians, for example, I was very clear about the contribution I could make and the changes I wanted to see happen. I’m very proud of the work we did there, including on the career trajectory of women in medicine. It was this role that also helped me realise that I could work effectively with government. "My interest in health, work and wellbeing was really born out of my own lightbulb moment. I was asked to deliver a talk to the Royal College’s Faculty of Occupational Medicine on the role of the physician in supporting occupational medicine. My work as a clinician and researcher specialising in rheumatology had benefited a specific group of patients, but in preparing this lecture I discovered much more about the social determinants of health – where you are born, your early years, education, nutrition, transport, employment, housing etc. It was this ‘lightbulb moment’ that led me to apply for the newly-created role of National Director for Health and Work, a job that I greatly enjoyed and which enabled me to become an adviser to government on health and work and led to the writing of three independent reviews. "When I was approached by headhunters I doubted whether the role as Principal of Newnham was for me. I was not a Newnham graduate, and so many great women have graduated from the College. Fortunately they chose me, and it has provided wonderful experience on many fronts – an amazing opportunity to become part of an incredible institution. I believe that I have used my skills and experience to help the students develop self-confidence, become more resilient and be willing to take more risks. As a medical scientist I am keen to see more women do STEM subjects and go on to careers in industry, the professions, technology or as entrepreneurs. "Being invited to choose my Desert Island Discs was a great honour. Music has played a big part in my life, and my choices included everything from Mozart to Gene Kelly to Tea for Two so that I would be able to carry on practising my tap dancing while cast away. And my luxury? Chanel No. 19, of course!"